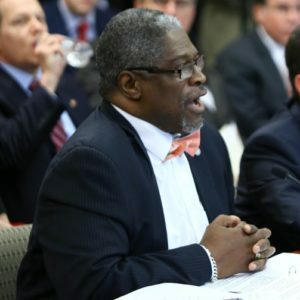 Kansas City Mayor Sly James has taken a stand against sweeping gun legislation the Missouri legislature could ensure becomes law. Lawmakers vote Wednesday on whether to override Governor Jay Nixon’s veto of a concealed carry bill which passed the legislature overwhelmingly this year. The measure would allow people to carry concealed weapons without permits. James held a meeting Tuesday in Kansas City to urge lawmakers to sustain Governor Nixon’s veto. He didn’t hold back criticism of legislators who will vote to override it. “Rather than looking for solutions to our gun violence problems, our legislature is poised to double-down on stupid” said James. A couple of Republican lawmakers criticized James for this comment. James responded by saying he wasn’t targeting lawmakers, but the legislation with his reference to “stupid”. James was joined at the Tuesday gathering by a number of local officials, including Kansas City Deputy Police Chief Cheryl Rose and Jackson County Sheriff Mike Sharp, who also spoke against the bill. Several groups who also oppose the bill are holding a rally at the state capitol in Jefferson City Wednesday. Republicans can override the gun veto if they vote as a block in both the House and Senate. The GOP holds a super majority in both chambers.